Sure, The Range has featured stuff about animals in the past, but today, we're featuring a new local animal. Unfortunately, it's not an adorable baby tiger, but let's not be ageist. Go to the Reid Park Zoo to check out their new addition. I mean, it's not so hot that you want to die anymore, so being exposed to the elements is now an option again! Thank baby Jesus. 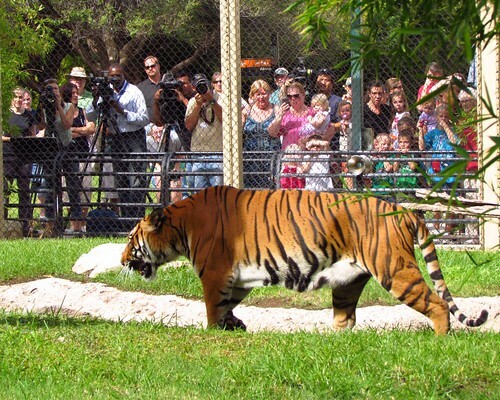 "Sita," a 10-year-old female tiger, went out on exhibit for the very first time this morning. She was calm and confident, and got a lot of attention from Zoo guests and the media. She'll have some time to get comfortable on exhibit by herself, and then we'll make plans to introduce male tiger "Baheem" back to the exhibit, and to Sita. We hope they will hit it off!